Kathmandu, Nov 18 : Nepal Police Wednesday said they have begun investigating the backgrounds of a pair of lovers who tried to extort former Nepal king Gyanendra's daughter Prerana Singh. "We have handed over the couple to the crime investigations department," said Deputy Superintendent Pradyumna Karki. "They will remain in police custody for 25 days while investigations are completed." Kathmandu, Nov 18 : Close on the heels of the Indian election authorities recognising third gender voters, Nepal's Election Commission has also begun a massive project to grant recognition to voters who are neither male or female but transsexuals and transgenders. 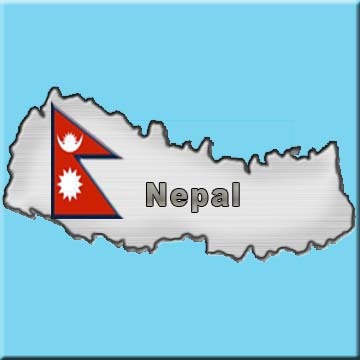 Shyam Sundar Sharma, joint secretary at the Nepal Election Commission, said the Himalayan republic had begun the process to upgrade the voters' list almost eight months ago and was happy at the Indian decision but not influenced by it. New Delhi, Nov. 18 : Professor S. D. Muni, India’s self proclaimed Nepal expert talking to a daily in Kathmandu, has refuted media allegations that he is associated with RAW (Research and Analysis Wing), India’s notorious intelligence agency. “I don’t know what people say or write in Kathmandu. Sometimes they write that I am RAW agent. I’m not accountable to what people write there. I didn’t facilitate any meeting,” said Professor Muni, who is often alleged in Nepal for fueling the Madhesh turmoil. Kathmandu, Nov 17 - American President Barack Obama has named a former US ambassador to Eritrea and ex-vice counsel in India as the new ambassador to Nepal. Scott H. DeLisi, a career diplomat, has been plucked from the career development and assignments division in the US State Department's Bureau of Human Resources, where he was serving as director, to be Washington's trouble-shooter in Kathmandu, where a three-year-old peace process has hit an all-time low. Kathmandu, Nov 16 : A Briton was arrested Monday at Nepal's only international airport for carrying high-denomination Indian currency notes which are deemed contraband in India's northern neighbour, police said. Venkatraman Jagannathan was arrested at the Tribhuvan International Airport in Kathmandu after he was found to be carrying Indian Rs. 50,000 in notes of 1,000-rupee denomination. 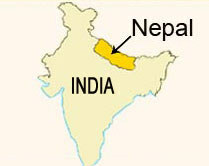 The possession of Indian 1,000-rupee notes, as well as 500-rupee notes, is illegal in Nepal. Jagannathan was bound for New Delhi on a Jet Lite flight. Kathmandu, Nov 16 Nepal's Maoist chief Pushpa Kamal Dahal Prachanda, whose party has threatened to call an indefinite shutdown if its demand is not addressed by Friday, flew to Singapore Monday in a surprise move, causing a flutter in political circles. The former revolutionary is accompanied by Maoist lawmaker and in-charge of the party's international affairs, Krishna Bahadur Mahara. Prachanda's aides said they are expected to stay till Wednesday though the departure has not been finalised. Maoist spokesman Dinanath Sharma said it was a personal visit. Kathmandu, Nov 16 - The three-day security talks between the home ministers of India and Nepal, scheduled to have started in New Delhi Tuesday, have been postponed indefinitely due to the mounting turmoil in Nepal. Kathmandu - One person was killed and five injured in a helicopter crash in a remote part of western Nepal on Sunday, media reports said. The Russian-built Mi-8 helicopter belonging to domestic carrier Manang Air crashed in Humla district, about 500 kilometres north-west of the capital Kathmandu, the independent Kantipur Television said. The report said a Russian flight engineer was killed and another Russian pilot was among the injured. Witnesses told the channel that the crash occurred after the helicopter's rear rotor struck a tree. Kathmandu, Nov 15 : A Russian was killed and five people injured when a helicopter crashed in a mountainous district in northern Nepal Sunday. The Russian flight engineer was identified as D. Satalo, police said. An MI-8 helicopter run by a Nepali domestic airline, Manang Air, was heading towards Humla district from Surkhet in midwestern Nepal when it crashed 40 minutes after takeoff. The chopper, flying goods, hit a tree at the Rudikot helipad in Humla, the first reports by police said. It was carrying two passengers and four crew members. Kathmandu, Nov 15 : With Nepal's coalition government refusing to ban the biggest slaughter of animals ever at a religious fair in the Terai plains, the republic's animal lovers are now pinning their faith on neighbour India putting a brake on the killings. Kathmandu (Nepal), Nov 15: World-renowned Slovenian climber, Tomaz Humar, considered as one of world''s greatest-ever mountaineer, has been found dead in the Himalayas. The shocking news comes days after the 40-year-old informed that he had broken his leg and was stranded up at 24,000-foot in northern Nepal. Gerold Biner, flight operations manager for the Swiss Air Zermatt, which was conducting rescue operations, said that Humar''s body was recovered early on Saturday by a three-man rescue team. “They called me, to tell me that the rescue mission was over,” The Telegraph quoted Biner, as saying. Kathmandu, Nov 15 : Five stinging slaps delivered by a junior Nepal minister to a senior bureaucrat have cost India dear, causing bilateral trade to come to a virtual standstill for five days. On Tuesday, Nepal's new Minister of State for Agriculture and Cooperatives Karima Begum created a controversy when she stormed into the office of Durga Prasad Bhandari, the chief district officer of Parsa on the India-Nepal border, and assaulted him for an alleged slight. Kathmandu, Nov 13 : An ace mountaineer with over 1,500 ascents who survived being trapped by avalanches in Pakistan is missing in northern Nepal since he fell during a solo climbing expedition. Slovenian daredevil Tomaz Humar, who was plucked from the jaws of death by a miraculous helicopter rescue from Pakistan's Nanga Parbat in 2005, is missing since Monday when he fell while climbing Mt Langtang Lirung, a 7,227m peak in the Himalayas in northern Nepal. Kathmandu, Nov 13 - A feisty Nepali actress has done a testosterone-pumping act in public with none other than Nepal's Maoist chief Pushpa Kamal Dahal Prachanda, getting the Maoist supremo to jive with her. Rekha Thapa, one of the top 10 stars in Nepal's film industry, made a name for herself about three years ago when she chose to dispense with doubles and perform her own stunts. The 20-something star probably performed her most popular stunt in the capital Thursday when she challenged Prachanda to jive with her - and he succumbed. Kathmandu, Nov 13 - Nepal's former Maoist guerrillas Friday kept up their siege on the heart of the government in the capital for the second consecutive day, ignoring a plea by beleaguered Prime Minister Madhav Kumar Nepal to call off the stir and open talks. The coalition government deployed nearly 10,000 Armed Police Force personnel in riot gear to secure Singha Durbar, the seat of the government where the Prime Minister's Office and nearly a dozen major ministries are located. While hundreds of Maoists cut off the approach roads to the enclave and began a sit-in, ministers however, learning their lesson from Thursday, made a beeline for their offices early at morning to escape the blockade. -phase protests against President Ram Baran''s move to overrule the erstwhile Maoists government''s decision to sack the then army chief, General Rookmand Katawal. Kathmandu, Nov 12 : The home ministers of India and Nepal would discuss greater security cooperation to combat cross-border terrorism in South Asia next week when Nepal's Home Minister Bhim Rawal arrives in New Delhi on a three-day visit. Rawal will be holding talks with his Indian peer P. Chidambaram and senior Indian security officials. The visit will kick off from Nov 17. Rawal will be accompanied by the chiefs of Nepal Police, Armed Police Force and National investigation Department as well as Home Secretary Govinda Prasad Kusum. Kathmandu, Nov 12 : Sporadic violence erupted and at least a dozen Maoist lawmakers and an ex-deputy prime minister were injured in clashes with security forces as Nepal's former Maoist guerrillas encircled the heart of the government in the capital Thursday and brought it to a standstill. The eight roads leading to Singha Durbar, the enclave where the Prime Minister's Office and major ministries are located, were cut off by thousands of Maoists early Thursday with their chief, former prime minister Pushpa Kamal Dahal Prachanda leading the rally from near the army headquarters. Kathmandu - Tens of thousands of Maoist supporters Thursday blocked all roads leading to the central government secretariat in the capital Kathmandu, virtually halting the government's work. About 60,000 Maoist supporters sat on several main streets that lead to the sprawling compounds of Singha Durbar, home to most of the ministries as well as the prime minister's office and government-owned radio and television stations. The Maoist protest prevented some ministers and civil servants from reaching their offices.